Your body needs protection and the natural way of getting it is by eating the right foods. So which of the super foods can you include in your diet regime. Let’s find out. Yoghurt: This yummy white delight offers you an optimum dose of probiotics to promote digestive health and well-being. Onions & Garlic: Add some garlic and onion to your dishes and you get allicin- an organosulfur compound with a number of anti-microbial activities. Ginger: This simply pulls the cough off the chest and is quite helpful in fighting viruses and bacteria by ensuring better circulation of oxygen within our system. Peppers: Hot peppers, especially cayennes, provide you with beta carotene, helpful for relieving symptoms of asthma. Oranges & Other Citrus Fruits: Citrus fruits are full of Vitamin C which fights cold and flu naturally and keeps your immunity strong. Green Tea: A cup full of polyphenols at the start of the day provides anti-inflammatory and anti-carcinogenic effects. Button Mushrooms: This amazing food item available in plenty has a significant effect on the immune system, especially on natural killer cells that help fight bacteria, viruses, and cancerous cells better. 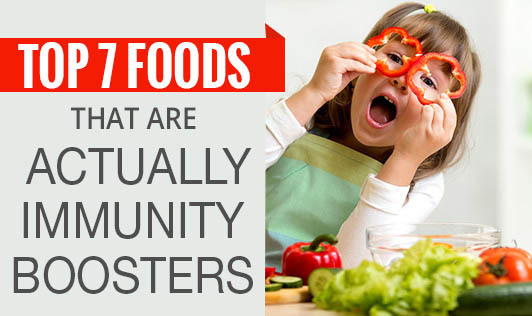 So, the list that you get at the end is a yummy feast to cram down with loads of immunity boosters too. Happy eating!